Long gone are the days when you could put up a website and Google will automatically send you traffic. Today you have to work at it. But WordPress, if properly configured using the tips outlined below, does give you a huge advantage over those using other (older / more costly) website technologies. Some costly, ‘nice looking’ websites we’ve analysed have coding so bad that Google still can’t work out what the site is about – Even though the owner has spent time on graphic design, good articles and the right keywords. As Matt Cutts of Google says, “WordPress does a lot of things right when it comes to SEO” (SEO = Search Engine Optimisation – Wikipedia). But, sometimes the migration process when moving from another platform is done so poorly, that their search ranking goes down, not up, killing traffic for 6 months or more… This normally occurs when there are no developers or seo people involved in the project, only graphic designers. Your Google ranking and traffic is determined not only by the 8 items we outline below, but also how well your website is performing in terms of site speed and up-time. These factors are often ignored, even by SEO ‘experts’. If your current website is too slow taking more than a few seconds to load, then Google WILL reduce your ranking, regardless of anything else you do. So, before you embark on any SEO project first ensure your site is running as fast as possible. To test speed, I use https://tools.pingdom.com/ Here’s a good overview from a fellow geek in the US running an eCommerce site. A major aspect of an SEO-friendly website is … its ability to be indexed by search engines! WordPress, with a good theme installed will be loved Google, rewarding you with more traffic than your competitors. But there is one housekeeping item to watch for. The dashboard setting page called “Privacy” that allows you to block search engines from your site. Some folks like to use this option while developing the site, so incomplete pages do not get indexed and associated with the domain. 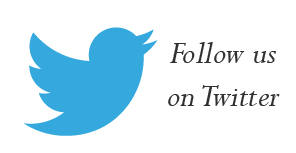 However, if you forget to unblock the search engines upon launch, your pages will not be indexed! WordPress’ default permalink structures offers no SEO value. However, it is quite simple to change your permalink structure to one that is SEO-friendly. 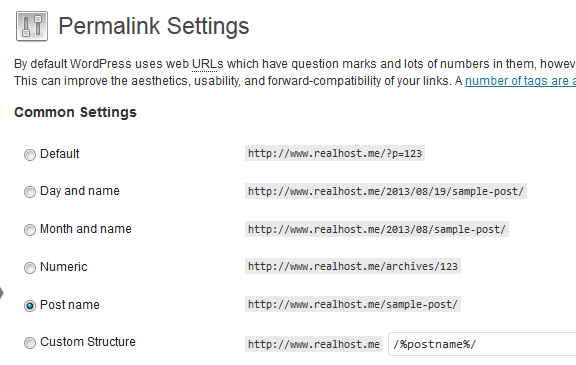 Simply navigate to the “Permalinks” link under Settings in your dashboard, and set to Post name. If you have an indexable, keyword-rich domain that uses post-relevant keywords in the URL, you are well on your way to organically building a powerful, SEO-friendly site. The most important piece of SEO real estate on any individual page or post is the title, which tells both readers and search engines what to expect from the rest of the content on the page. And Google is always looking for ‘exact matches’ for keywords and the first place it looks is the titles of website pages or posts. Getting relevant keywords into your titles consistently is imperative. Meta descriptions are also important. Remember that the description is what search engine users will see when your result pops up. Crafting compelling copy is the key here. You’ll want to include keywords as well, primarily because those are (by definition) the words your users have in mind when they’re looking for what you offer. One way to ensure that search engines index your content properly is with a well-structured XML sitemap. 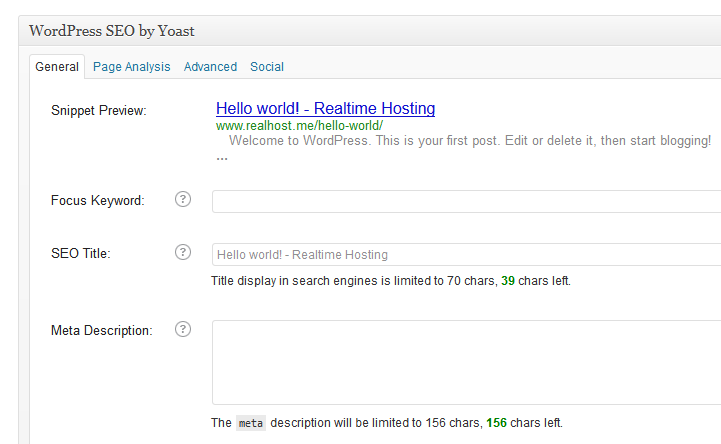 Fortunately Yoast has full sitemap functionality built into his free SEO plugin. And sitemaps are not just for posts. If your site hosts videos, there are major SEO benefits to a properly configured video sitemap. (Yoast provides a special add-on that further enhances video rankings.) 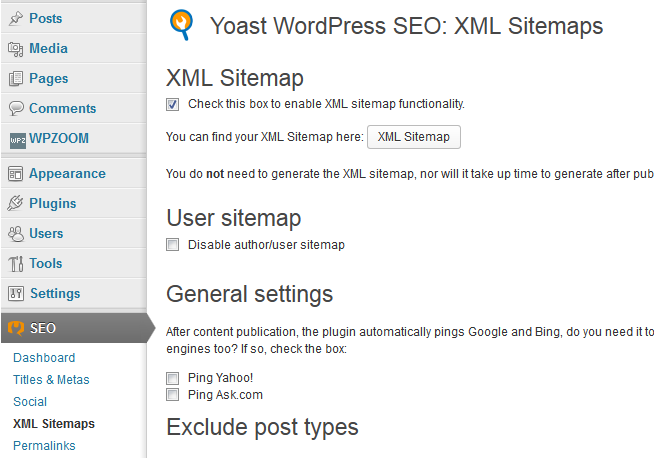 The Yoast plugin generates the sitemap automatically and auto-submits posts to the Google search engine. However it’s also good practice to manually add this sitemap to Google when setting up webmaster tools, discussed later. Getting the right keywords is vital, especially in the page titles. This is a huge topic, but best outlined in these two videos below. Here’s an intro to setting up an account with google to use their free keyword research tools. Remember to change the various settings from US to New Zealand. p.s. Jim runs a successful SEO company helping clients across Australia ‘be found’ online. He’s a huge fan of WordPress, migrating many of his clients to this platform. If you want to get serious about SEO and getting traffic, you’ll also need to become familiar with Googles Webmaster tools. To me webmaster tools is one of the most important, yet least ustilised SEO toolsets. It provides direct feedback as to what Google thinks of your site and an idea of the traffic you’re missing out on. The site topics to focus upon to grow. You’ll need to have a Googleapps or gmail account first. At the same time, we setup Google Analytics too, but this itself is a big topic and will be covered in separate meetups later. Yes, this stuff can get tricky for newcomers as some of it is quite geeky, but these Google toolsets provide invaluable feedback on how to optimise your site keywords for more traffic, as well as be notified by Google of any problems it has crawling your site. Note this is not the end of SEO efforts. Here’s we’ve been focused upon the ‘on-site’ issues you have control of. Some work is also needed around backlinks, social media, AdWords etc. 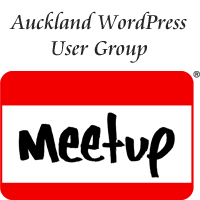 These topics are better covered in other meetup groups. If you want help in this area, we can help.